“You’re going to have a baby!” There are probably no words that have a greater effect on a woman’s life than these. Learning that you are to become a mother is a wonderful, scary, challenging, and emotional experience. But faithful yoga students always wonder if any asanas are contraindicated during their pregnancy and how they might be modified to make them safer and more enjoyable. Indeed, some cautions and adaptations to the standard yoga poses are advisable because of the physiological changes that take place in the pregnant body. In addition, I suggest postures that can alleviate fatigue in the upper back due to postural stress, as well as those that specifically stretch the birth area. Faithful yoga students always wonder if any asanas are contraindicated during their pregnancy and how they might be modified to make them safer and more enjoyable. To understand the adaptations in standard poses that are necessary for pregnant students, it is important to remember that pregnancy has a profound effect, on much more than the belly. Pregnancy affects every organ system through those powerful “natural drugs,” hormones. Bones can lose calcium. Joints are looser because connective tissue relaxes. The smooth muscle activity of the digestive and eliminative tract slows; there is an increase in blood volume, which can contribute to varicose veins. Skin is stretched. Mucus membranes are more active (so pregnant women may feel they have a cold most of the time). In addition to the obvious changes to the breast and uterus, the abdominal organs are affected by the decreasing space in which they must function. The bladder especially feels the crunch. Because all of these systems are affected by the changes of pregnancy, it is important to adapt yoga asanas for the mother-to-be. The two main considerations are whether or not to practice inverted poses, and concern about lying on the back, either during relaxation exercises or as part of other poses. I do not recommend inversions during pregnancy. I did not follow this recommendation myself for my first two pregnancies (I remember practicing handstands in the center of the room while I was seven months pregnant with my first son). 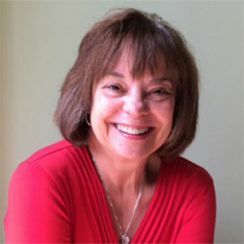 But I have changed my mind because the placenta affixes itself to the wall of the uterus during the first trimester, and inverted postures might interfere with this implantation process, especially the headstand or shoulderstand (which are held for longer periods than a brief handstand). I have no scientific studies proving that inversions can be detrimental, but I want to be extremely conservative when teaching pregnant women. The second trimester is the time when there is the most room for the baby and the cord to move around and become entangled. Compression of the cord during pregnancy or birth can have serious consequences for the baby, and it is possible that inverted postures could cause this. Going into headstand could possibly strain the already stressed abdominal muscles as well as add more weight than normal to the cervical spine. As for the third trimester, when a pregnant woman inverts during this time, the significant weight from the placenta, the amniotic fluid, the baby, and the other abdominal organs falls back down against the diaphragm. And this accumulated weight could limit maternal breathing as well as increase inter-thoracic pressure on the heart. 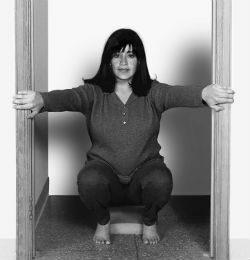 There is a further possibility that the inversion could stimulate the baby to move from the preferred head-down position to a breech position (defined as any body part of the baby presenting first in the birth canal other than the head). Breech presentations always make childbirth more difficult. Finally, I do not recommend practicing the shoulderstand during the last trimester because students usually lie on their back to get up into the pose. And going into headstand could possibly strain the already stressed abdominal muscles as well as add more weight than normal to the cervical spine. Lying on the back after the first trimester of pregnancy may cause vena cava syndrome, and thus it should be avoided during asana practice. (The inferior vena cava is the large vein which returns blood to the heart from the lower body; it is located at the back of the body near the spine.) When a woman more than approximately 14 weeks pregnant lies on her back, the weight of the enlarged uterus, the placenta, the amniotic fluid, and the baby can fall back on the vena cava and compress it. As a result, this could cause the bloodflow to the mother’s heart to be reduced, restricting the amount of blood pumped to the placenta and decreasing the amount of oxygen reaching the baby. Sometimes pregnant women who lie on their back will complain of feeling lightheaded; this is a sign of vena cava syndrome, sometimes called supine hypotension syndrome (supine = lying on the back; hypotension = low blood pressure). So even though many women feel comfortable lying on their back through most of the pregnancy, I nevertheless suggest that pregnant yoga students lie on their side for shavasana (relaxation) and avoid lying flat on their back in class, especially during the last trimester. If there is a pregnant woman in my classes when we are doing a supine pose, I support her with a bolster or pillow so she is inclined at an angle of approximately 30 to 40 degrees, so that her weight will not compress the vena cava. Even if she does no other asana, the absolutely crucial pose for a pregnant woman to practice every day is shavasana, the deep relaxation pose. Life is fatiguing; pregnancy is even more fatiguing. In addition to the demands of carrying around extra weight, hormonal changes can also contribute to fatigue, especially in the first trimester. Once early in my first pregnancy I left the table at a dinner party to go to the bathroom. On my way back, I passed the bed in the guestroom and impulsively lay down and went fast asleep, forgetting about dinner and party altogether. Hormones cannot be denied. I teach pregnant women to relax on their side after the 14th week. Not only does side-lying shavasana prevent vena cava syndrome, it is also useful as a position during labor, and later as an effective and restful nursing position. Begin by placing a thick blanket on the floor to offer padding for the side of the hip and shoulder. Lie down on whichever side seems to be most natural, with the knees bent, taking care to keep them even with each other. Then props should be added to support every part of the body. Place a thin bolster or thick long blanket between the lower legs so that the knee and ankle are on the same level. Add rolled blankets or a bolster in the front to drape the upper arm over; another bolster can be leaned against the back to provide a sense of security. Place a double-folded blanket under the head and one under the lower wrist. Feel as if you could go to sleep, as if your whole body is cradled by the props. If you wish, an eyebag can be placed on the neck to facilitate relaxation. Stay in the pose for 15 to 20 minutes. Some women like to use the first part of shavasana to silently talk to the baby or simply hold the baby in their loving imagination. Breathe softly and naturally. At the end, use the arms to sit up slowly; stand up slowly as well. Practice this pose at least once a day, every day. For many pregnant women the increased weight of breasts and belly can cause the upper back to become tight and sore. To stretch out the upper back, try the half dog pose. 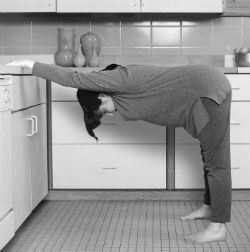 It can be practiced against a wall, but my favorite place is the kitchen sink, which allows you to pull back and stretch further. Place the hands on the sink (fingers over the edge) a little wider than shoulder-width apart. Walk back until the arms and back are parallel to the floor and the legs are at a 90-degree angle to the body. Make sure that the feet are wide apart (18 to 24 inches), pointing exactly straight ahead, and that the knees stay straight. The next step is to lean back and hang with more weight on the feet, thus stretching the shoulders and upper back. The breath remains steady; the head hangs down. Hold the pose for 5 to 10 breaths. To prevent dizziness as you come up, inhale as you walk the feet toward the sink. More experienced students can try placing the feet closer to the sink for more of a hamstring stretch. 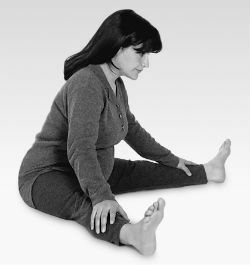 The next three poses help prepare the pelvic area for childbirth. The first is a simple squat. This position is natural for much of the world, but it is often difficult for Westerners. To practice squatting you will need something firm to hold on to in order to prevent falling back. Some women use a large piece of furniture, but I prefer the two sides of a doorway. It is fine if you come up and re-adjust the feet to a wider position if that feels more comfortable, but it is important that you keep the heels on the floor. If this seems impossible, try putting a book under the heels, gradually using thinner and thinner books as the backs of the calves stretch out over time. Stay in the squat for 7 to 10 breaths, and come up with a big inhalation. If you find this pose difficult you are not alone, but it is useful for stretching the soft tissue around the birth canal. Some women actually give birth in this position or one very close to it. Work with this pose two times a day and try to hold it for a minute or two unless you feel discomfort in your knees. Remember to keep breathing as you hold the pose and to inhale as you stand up again. The next two poses for preparing the pelvis are related. We’ll begin with the seated angle pose (upavishtha konasana). Sit on a comfortable surface with the legs straight out in front of you, and open the legs apart. Keep the knees straight and the kneecaps pointing toward the ceiling (not rolling in or out, as they sometimes have a tendency to do). If it is easy for you, reach toward the feet. It is fine to feel a slight stretch in the middle of the inner thigh muscles, but if you feel a strong isolated stretch pinpointed at the inner knee, you may be overstretching; in this case, bring the legs closer together. If you find that your spine rolls backward, causing the belly to feel compressed, then insert the corner of a folded blanket or two under your buttocks so you can roll the pubic bone forward toward the floor. This elevation will move the pelvis into a neutral position, thus allowing the spine to lengthen upward with less strain. You may also want to practice this as a supported pose. To do this, place a bolster in front of you, lean forward, and rest your chest and forehead on the bolster. Be sure to give room for your belly/baby. Whether you practice the seated angle as an active pose or as a restorative one, make sure your breathing remains soft and natural throughout. Follow the seated angle pose with the bound angle pose (baddha konasana). Sit on the floor on a blanket or sticky mat. With an exhalation, bend your knees one by one and place the soles of the feet together. Let the knees drop outward. You may want to interlock your fingers and place them over the toes. Stay in the pose for as long as three minutes, breathing easily. Keep the legs still; “bouncing” the legs up and down has long been proved an ineffective stretching technique. To make this pose easier, place rolled blankets under the legs as near to the hips as you can. Allow the legs to rest on the blankets, and notice the softening in your belly and pelvic floor area. To come out, place your hands on the outside of your knees, and lift the knees up and together. Then slowly straighten the legs out in front of you. Finally: whatever poses you choose to practice during pregnancy, do them with joy and gratitude. I have no doubt that these feelings will permeate both your body and your baby and that you will have a wonderful birth and a healthy child. Minimize vigorous exercise during your pregnancy; replace it with a daily walk or swim.